This entry was posted on Tuesday, January 29th, 2019 at 12:09 pm. Westbury Shed ended the year on a high – literally! Members repaired, cleaned and replaced the sign at the Visitor Centre, a community-based project, along with others completed during a busy and eventful year. The summer saw Shedders running a Repair Café where local residents brought household items and cycles for repair, supporting the Caribbean Carnival and Morrisons‘ summer charity fundraising event. Help was given to the Leos [young Lions] during their impressive restoration of the Quakers Graveyard and support from the Westbury League of Friends and Gooding Accounts helped the move to larger workshop premises, enabling member participation to increase. 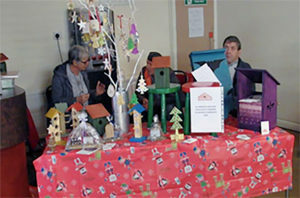 A Shed member submitted a design to the ‘Transform-a-Chair’ event at Holy Trinity Church, Dilton Marsh and at auction was able to raise the largest individual bid, an indication of the impressive work shed members produce for the community and also on personal projects. “The allotment continued to produce a wealth of vegetables despite the challenging dry conditions, some of which were offered to Crosspoint. Drawing towards the end of the year, members again supported Morrisons’ charity event and the town Christmas event and participated in All Saints Church tree festival. Much comment was made about the handmade tree decorations and our ‘Fred the Shed’ ornament taking pride of place on the top of the tree.